Europe is not the spiciest place in the world, but there are few corners that offer burning gastronomical sensations. So for the travelers that can't live without their spicy flavors, here is the list of the top 5 dishes in Europe that are a must to try for throat-searing, unforgettable experience. Many assume that Spanish cuisine is as spicy as the temperament of the locals, although it is far from true. Spain citizens love spices, but their preference for the dish hotness is rather mild. However, every rule comes with an exception, so does the Spanish cuisine. Hence, if you travel to Spain and have spicy food cravings then another vital Spanish phrase, which you need to add to your travel vocabulary is "Patatas Bravas, por favor!" The spicy dish is quite simple, consisting of two key ingredients. The hot fiery red sauce complements well the fresh potatoes, that have been peeled, diced and fried. The composition of the dish varies from one Spanish province to another, preserving the heat of the red sauce. Sabroso! Try the dish on any of our gastronomic tours to Europe, including quality sightseeing days in Spain. Austria like a true German-speaking country, could not get by without sausages, especially Bratwurst type, in their cuisine. The sausages are key in the Austrian diet and are often found in the street food too. Thus if you visit the country in the heart of Europe, make sure to bite into Bosna - a spicy sausage sandwich, for a truly complete Austrian experience. The sandwich originates from Salzburg and is consisting of Bratwurst or Nadanitza sausage, ketchup, mustard, onion, and most importantly - curry powder, that makes the dish stand out from the rest of the street food. Carefully prepared ingredients are then wrapped in a grilled white bun, often resembling a hot dog. Savor more than hot Bosna during any of the small group or private tours to Central Europe with quality days in Austria. Italians, similarly to Spanish, are not keen on very hot food, so the hunt for the spiciest dish in Italy lead us to the right tip of the Italian peninsula - Calabria. 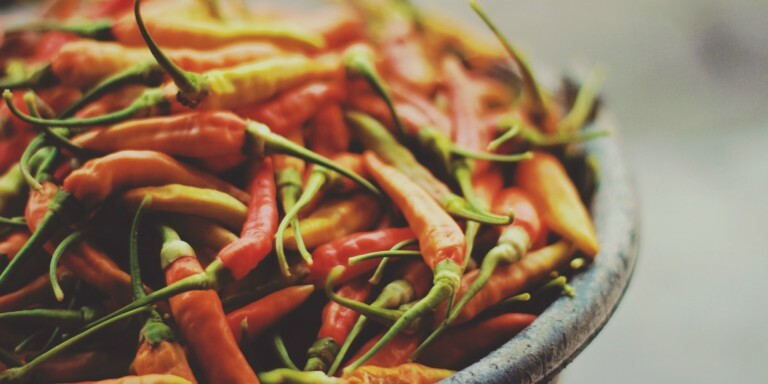 The most iconic ingredient of the region is peperoncino - the fiery red peppers that are used in many different ways. You can often taste them in chocolate, grappa (vodka made from grapes), sausages, oil - pretty much every sort of food type in the region. If you find yourself in the spicy corner of Italy you should try the dish of lost memory - the spiciest pasta in Calabria. The pasta is made with richest chili oil and croutons. The smell and the taste will leave a burning sensation in your throat and definitely make you forget everything else in the world. On a bright side, you could bring home chili infused chocolate! Experience the spices of Italy on a gastronomic tour to Tuscany. Spain's neighbor - Portugal, often attracts travelers with its sandy beaches, rich wine, and beautiful weather and of course - appetizing cuisine. When it comes to spicy food, Portugal like the rest of Europe, prefers mild, rich flavors, saving their receptors for an occasional spicy dish. The perfect fiery PortuguesTbarbeque'. The tasty chicken skewers are widely available from the street vendors on the busiest roads all across Portugal. The secret to the spicy recipe is in the preparation of the poultry, it is spatchcocked and thoroughly marinated in a mix of ingredients, including olive oil, garlic, lemon, white wine and spicy paprika. Another important aspect of cooking the dish is to constantly baste it with Portuguese signature chili sauce Piri Piri and marinade whilst rotating over a coal pit. Taste more than spicy chicken during your private gastronomic tour to Europe with customizable, guided time in Portugal. An unexpected ending to the discovery of spicy dishes in Europe brings you to the largest country in the world - Russia. The Russian cuisine is diverse and heavily influenced by Northen and Eastern Europe, Caucasian and Asian cuisines, with staples of the Russian diet being - seasonal soups and stews. One of the nation's favorite soup that will surely heat you up is Solyanka. The thick, spicy and sour dish can be made with either meat, fish or mushroom, to satisfy all types of cravings. Whichever the type, Solyanka soup always consists of pickled cucumbers with brine, potatoes, sour cream, dill, and cabbage. End the spicy European feast in Russia, and choose from Russian river cruises, Trans-Siberian railway adventures or classic land tours to Russia's best destinations. All in all, if you're a fan of travel and a foodie too, a trip to Europe certainly won't disappoint you. The cuisines of the many countries making up Europe are as rich as their culture and history!